Lisa Becking (Wageningen University and IMARES) and I, together with Sea Turtle Conservation Bonaire (STCB) ; Mabel Nava, Sue Willis and Robert van Dam have shown in a recent publication that sea turtles who breed in Bonaire, Caribbean Netherlands, migrate great distances of up to 3500km to reach their foraging grounds across the Caribbean in 10 different countries. For this study 24 sea turtles were deployed with satellite transmitters by Mabel and her team at STCB between 2003-2013. This study identifies 2 corridors that are used during their post-nesting migrations and identifies countries where sea turtles breeding at Bonaire face threats from legal turtle harvesting, illegal take, and bycatch. Sea turtles are long-lived migratory reptiles with a complex life cycle. Mature sea turtles breed in the vicinity of the beach beach where they were born (called a rookery) and at the onset of the reproductive season, adults migrate from their resident foraging area to their natal rookery region to breed. The Dutch Caribbean island Bonaire is home to small nesting beaches of three sea turtle species, Eretmochelys embricata, Chelonia mydas, and Caretta caretta. For small rookeries, such as those utilizing the islands of the Caribbean Netherlands, knowledge of turtle migratory behavior remains scarce. 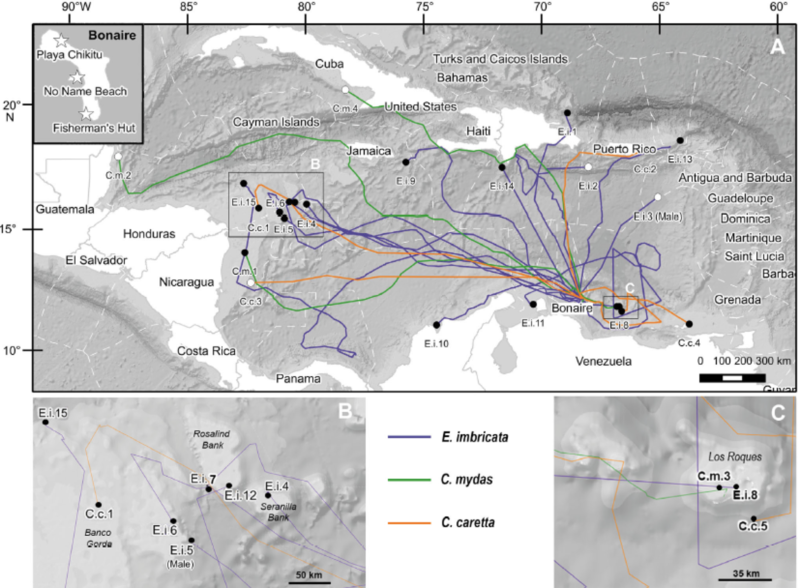 Knowledge of such linkages is valuable for conservation efforts, as foraging aggregations are not homogeneously distributed across the Caribbean Sea and migration routes can vary among individuals of the same nesting colony. Understanding turtle spatial ecology and identifying critical foraging habitats and movements is integral to effective sea turtle conservation. To elucidate the geographic scope of the populations of sea turtles breeding at Bonaire and Klein Bonaire (Caribbean Netherlands) the team examined the post-breeding migratory behavior of 5 female loggerheads Caretta caretta, 4 female green turtles Chelonia mydas, and 2 male and 13 female hawksbill turtles Eretmochelys imbricata during the years 2003−2013 using satelite tracking. Nesting sea turtles are a key tourist attraction in Bonaire, and they are at risk of harvest in the waters they frequent. Given the wide dispersal, these turtles are at risk of legal or illegal harvest, which impacts conservation efforts and threatens turtle populations far removed from those territories. The breeding turtles from Bonaire face particular threats in the countries of Nicaragua, Panama, Venezuela, Colombia and Haiti. 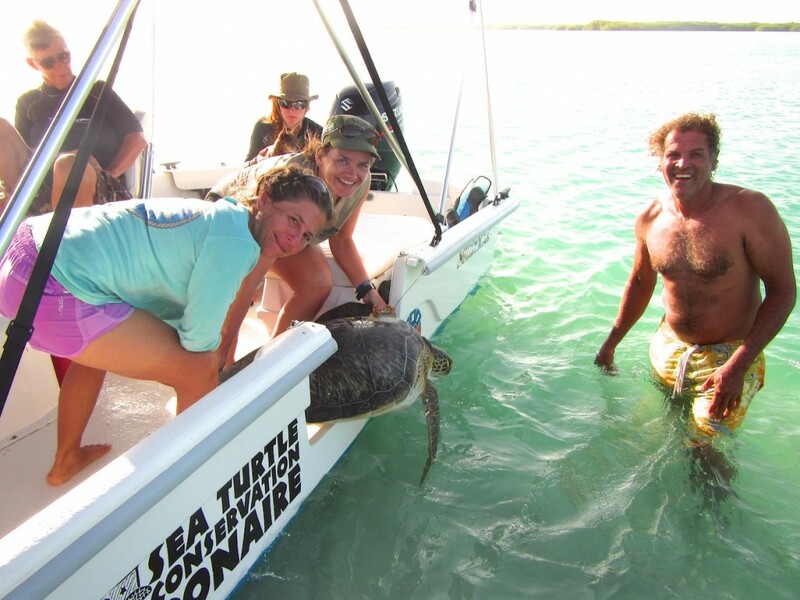 Sea Turtle Conservation Bonaire has been active in sea turtle research, monitoring and conservation on Bonaire since 1991. Since the year 2010 Bonaire has formally become part of the Caribbean Netherlands as a special municipality (“Bijzondere Gemeente”) of The Netherlands. The Netherlands is obliged to protect marine turtles inhabiting the Dutch Caribbean waters, as a signatory to international treaties (e.g., Cartagena/SPAW protocol, Convention on Biological Diversity, CITES Convention, Convention for Migratory Species, Inter- American Convention for the Protection and Conservation of Sea Turtles). As such, The Nature Policy Plan of the Dutch Ministry of Economic Affairs indicates sea turtles as a high conservation priority. The current work is linked to Beleidsondersteunend Onderzoek of the Ministry of Economic Affairs and to the project “Ecology and Conservation of Green and Hawksbill Turtles in the Dutch Caribbean” which is funded by The Netherlands Organisation for Scientific Research (NWO). All females? Experimental nest temperature assessments will show.